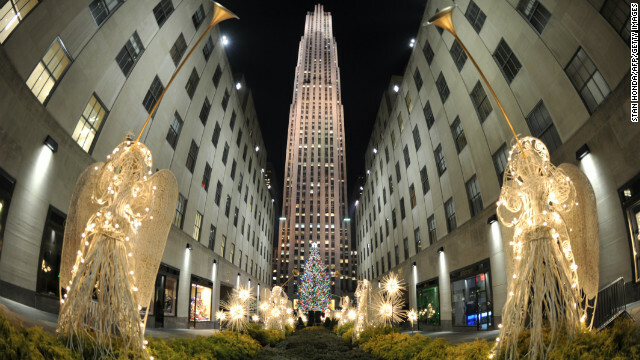 The Rockefeller Center Christmas Tree, New York City. (CNN) - Welcome to the Sunday Playlist, sounds and stories we've discovered from other audio producers and that we want to share with our listeners. This week's Sunday Playlist, the best Christmas and Hanukkah stories from around the web. But first, a look back at some of the more thoughtful pieces centered on last week's horrific shooting in Newtown, Connecticut. The killings tore an emotional gash through the nation's psyche, and sparked new conversations on issues like gun control and mental health. From NPR's All Things Considered comes advice on how to respond and provide support for someone you know who's lost a child. Linton Weeks, the piece's reporter, speaks from heartbreaking personal experience. The topic of gun control has moved to the top of pubic debate this week. You've probably heard many sides of many arguments. Public Radio International/WNYC's excellent show The Takeaway takes a step back though, and asks a very basic question: "Why own a gun?" Every year since 1932, Britain's monarch has broadcast an annual Christmas Day speech to the Empire. King George V started the tradition using radio to deliver the first message. In 1957, Queen Elizabeth delivered the first televised Christmas message. This year the Queen produced the very first 3D Christmas message that will be broadcast on Christmas Day. You'll be able to see it on the Royal's YouTube channel. And that first radio broadcast 80 years ago by King George V was written by Rudyard Kipling. An excerpt is below via AudioBoo. Or check it out in its entirety on this page. Truman Capote's "A Christmas Memory"
Finally, one more bit of storytelling for the season, this time from Truman Capote. In 1956, Mademoiselle magazine published the short story by Capote. Set in the South during the Depression and largely autobiographical, the story describes a friendship between a seven-year-old boy and an elderly woman and ultimately illustrates the value of giving during the Christmas season. To hear an abridged version of the story read by the author himself, check out this episode of This American Life. That's it for today's Sunday Playlist. Check back next Sunday for a look at the upcoming week's best podcasts. We all hope that you have a happy and healthy holiday.